The adverbs hin and her cause much confusion for German learners. There are no direct equivalents of either of these in English and to English speakers they often seem superfluous in a sentence. German in fact signifies directional movement (vs. position) in several ways that English does not. The adverbs hin and her are examples of this specification of movement in a particular direction or from a point of origin. hin generally indicates movement in a direction away from the speaker toward a particular destination. Wir gehen zum Hafen hin. We are going to the harbor. Schau mal hin! Look (over there)! her generally indicates movement from a point of origin in a direction toward the speaker. Komm mal her! Come over here (from there)! Wo bekommen wir das Geld her? Where will we get the money (from)? Hin and her are used in their most literal sense with verbs of movement (e.g., gehen to go, kommen to come) or activity that involves direction (e.g., sehen to look, geben to give, reichen to hand over). Often they appear as separable prefixes (e.g., herkommen , herholen, hinlegen, hinschreiben). More specific directional adverbs are created through a number of compounds that combine hin and her with prepositions that denote direction (e.g., herauf, herab, heraus, herein, hinauf, hinüber, hindurch, hinzu) or with other adverbs (e.g., hierher, woher, dahin, überallhin). Er geht die Treppe hinauf. He is going up the stairs. Er kommt die Treppe herunter. He is coming down the stairs. Der Apfel fiel vom Baum herab. The apple fell (down) from the tree. Der Apfel fiel ins Gras hinunter. The apple fell (down) into the grass. Note in particular the contrasting examples with the apple. Here, the perspective of the speaker is unclear. Is the speaker in the tree? Under the tree? Beside the tree? But the additional prepositional phrases specify respectively movement from a point of origin (vom Baum), in which case her is used, and movement toward a particular destination (ins Gras), in which case hin is used. The adverbs hin and her also appear in expressions with extended meanings. They occur for instance in time expressions (e.g., eine Weile hin a while longer still, schon viele Jahre her many years ago). They also appear in a number of fixed idiomatic expressions (e.g., hin und her back and forth, hin und wieder occasionally, hinter dir her behind you [and moving in the same direction as you], auf seinen Rat hin at his advice, von der Erziehung her on account of one’s upbringing). And they occur as verb prefixes with sometimes abstract or figurative meanings (e.g., herstellen to produce, hinrichten to execute). Finally, in actual everyday usage the lines between hin and her are blurred. While southern German speakers tend to maintain the distinction between the two adverbs, in German spoken north of the Main River her is favored in most situations regardless of direction or perspective, and this is commonly reduced to ‘r (herüber > ‘rüber, hinaus > heraus > ‘raus). No wonder hin and her cause confusion for learners! Apart from being aware that these variations exist, the basic guidelines of movement toward a destination (hin) and movement from a point of origin (her) can at least provide a useful point of reference. Resources consulted: Hammer’s German Grammar and Usage; Das digitale Wörterbuch der deutschen Sprache des 20. Jahrhunderts; Grimms’ Deutsches Wörterbuch; Bastian Sick, “Nach oben hinauf und von oben herunter“, Zwiebelfisch in Der Spiegel (2005); “rein, rauf“, Atlas zur Deutschen Alltagssprache (2008). This is the most simple and clear explanation that i have found. Thank you!! That was a good explanation! Hi! Thanks a lot for the page, one of the clearest I found!!!! Just, I didn’t get the examples of the apple. Are you saying that the position of the speaker is irrelevant? 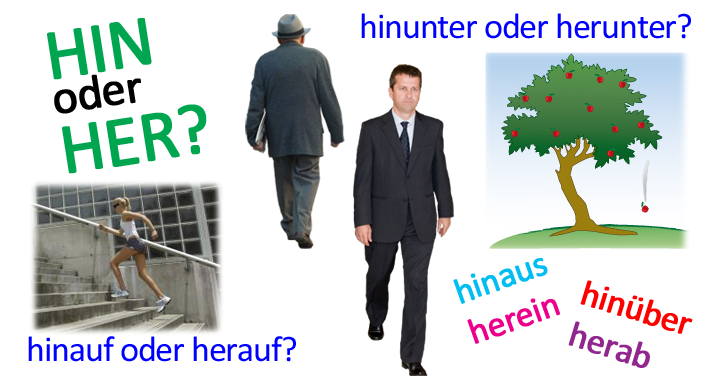 In your example Komm herunter!, the assumption is that the speaker is in a position below the person being spoken to. You cannot say *ins Gras herunter because ins Gras is a phrase describing destination [into the grass] and herunter is an adverb/prefix indicating point of origin [because of the prefix her]. Does that make sense? German words meaning to is a topic for another post. Well, this was a revelation! And I have an MA in German and have been teaching German since the Tower of Babel. I had never heard about the “destination vrs origin”. This sheds light on why a native speaker thought it sounded so hilarious when I wrote a description of a teenager lounging on a couch, and wrote “ihr Kopf hing hinab.” Thank you very much! Since the Tower of Babel? Oh my! Then you’ve been teaching perhaps as long as I have. :) Glad the explanation made some sense. Just one question: Mit den Taxis kommen Sie uberall hin. Does it translate “You get everywhere by taxi.” ? Dankeschön! Nach dem Lesen dachte ich, “wohin, woher…”. Danke nochmal für diese sehr klare Erklärung. Ich dachte, dass ich niemals das verstehen würde :). Für mich geht das. Alles Klar.